style="text-align:center;"> Please note that this topic has not had any new posts for the last 4020 days. 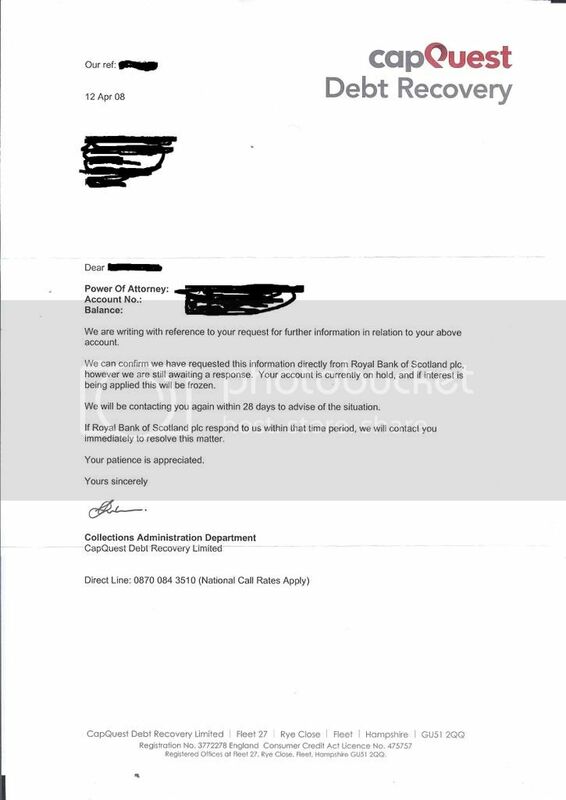 Approx 10 years ago I had a Royal Bank of Scotland account and a £10000 loan, I fell into financial difficulty with the account becoming overdrawn and the loan payments falling into arrears, I also had other debts at this time so the letters were pouring in from the DCA's. 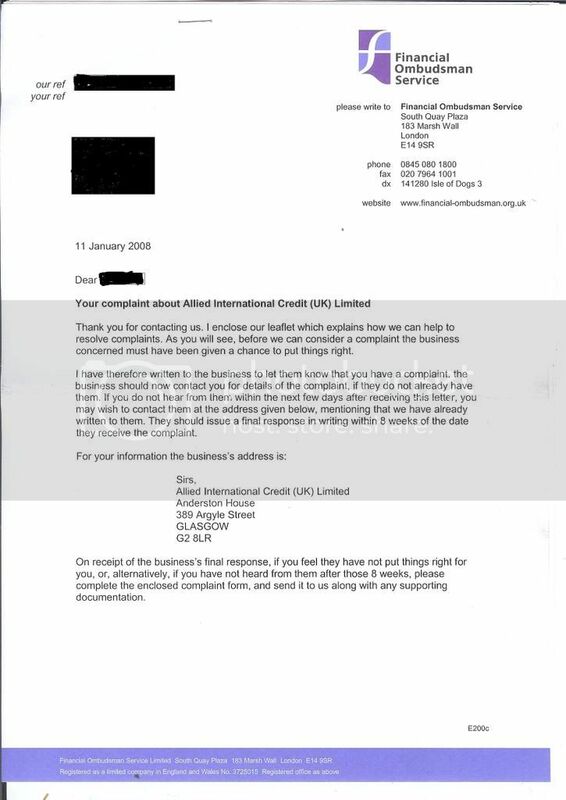 The DCA instructed to collect this particular account was Allied International Credit and the amount they said I owed to the RBOS was around £21000 as they have lumped both bank account and loan together, I disputed this as I was only overdrawn by £900 on my bank account and had made payments on the loan before I defaulted, they never listened and continued to threaten me with court etc, I was worried sick with their threats and actually drawn in by them and commenced to pay them £70 a month for a while, then I stopped paying again due to finance problems and the phone calls came, I just ignored their number, and sent them payment when I could. 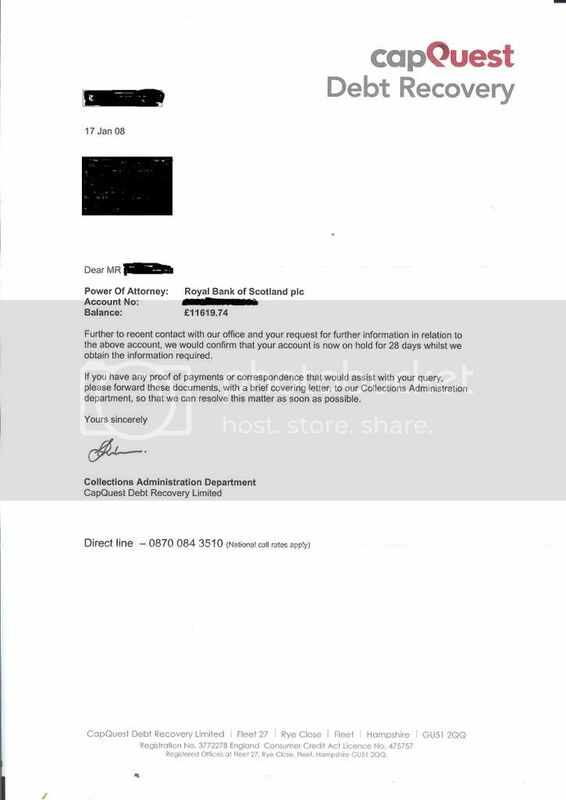 In November 2007 I received two letters from Capquest stating they had bought both the flat loan account and bank account from RBOS the loan being around £11739 and the bank account £182, now this to me seemed like more realistic figures compared with AIC as my balance with them was still in the regions of £19000 . I have since paid off all my other debts and this is the last one remaining, I want to know exactly what I have paid back and exactly what I owe and to whom. My situation now is that I am paying Capquest £70 a month and AIC are still hassling me for "Full Payment of approx £19000". I have told AIC that Capquest are dealing but they refuse to listen and continue to ring me. Two DCA's asking for the same debt and with different amounts owing??? Today I have sent CCA Requests to RBOS (Branch Address), AIC and Capquest, Have I done the right thing?? and should I continue to pay Capquest?? p.s how do i make the title of my thread bold? Were all the requests sent with £1 payment by signed for delivery? Did you ask for a full statement of the account. How have you been paying cheque/giro etc? Usually it is the company demanding the money that I send them to. But the fact you have CCA'd any of them is the first step in finding out if they have the right to collect. Is it worth me still paying Capquest the £70 monthly or should I wait till they relply to my CCA request. 12 + 2 days (working days ) after your request was sent will put them in default. If they haven't sent you a copy of an enforceable CCA by then you can stop payments. Scan and post anything they send covering personal details to get an opinion. If your nrxt payment is due before then I would put it to one side and only send it if they come up with a kosher CCA. Next payment is due on 1st Feb, if I havent received an enforcable CCA by the end of Jan I will withold payment. So if I dont recieve a CCA within the 42 days from either of the three mentioned are the debts unenforcable? what would be my next step? Whoever is claiming money from you for an account covered by a consumer credit agreement (Loans and Credit Cards) are obliged to supply you with a copy of that agreement within 12+2 days if they fail to do so they are in default and should not continue to persue you for payment until they do so. After a further month they commit an offence. the 12 + 2 are working days so don't include sat sun or BH. If no CCA supplied you can stop paying if they continue to harrass you after a further month report them to trading standards. Keep copies of everything you send and recieve along with all proof of postage and sighned for recipts from the Royal Mail tracking, I keep mine in the see through sleeves you can get and a 4 ring binder. The bigger the better. Don't forget to post up any alleged agreement for opinions. 2.5 Putting pressure on debtors or third parties is considered to be oppressive. My CCA requests were delivered today according to the royal mail site so I'll wait the responses. Does this mean they have sold the debt and can no longer supply a CCA? And there is no mention of AIC. This morning I have checked my bank online and saw that the £1 cheque for CCA and £10 for S.A.R that I sent to AIC have been cashed. So if RBOS say Capquest are dealing and Capquest need 28 days to find the CCA whats the chances of there being one? I have paid loads of payments to AIC over the years but I am very suspicious that they have not been applied to my account. I just want to know exactly how much I owe and what I have paid. Not a peep from AIC since last phone call on Wednesday. Have you had any updates since? I have AIC chasing me for a £900 debt to NatWest that I tried to pay off - I told them I would only pay off what I owed and none of their silly wee charges - the guy threatened to come to my house so I told him hey I am on Argylle Street the now with some pals - why don't I come and see you and save you the trip?? I just can't believe that despite me offering to pay off my rightful debt, they won't let me - nor will they negotiate - so now what - Summary Cause action? The legal fees alone will cost them more - and the beauty of Scots Law is that if I make them an offer of the debt (known as a "tender") and they refuse, if the Sheriff finds that I truly owe them £900 which is already admitted but none of the fees over and above, THEY have to pay all costs!! Bring it on AIC - lets see what you are made of!! Hey guys, I have had dealings with this kiddon company before. Asking them for proof that they either own or are authorised to deal with this debt is always good for a laugh. Ask them for a letter of assignment from RBS giving them your details etc to chase, bet they won't have it or get V sniffy. This company generally don't have a clue what they're doing and just rely on bullying money from folk. Good luck with them loL! I am in no way a legal advisor and only speak from my own experiences and the helpful advice of those in the same boat! The response from your SAR should be Interesting! Well a quick update, I havent heard a peep from capquest apart from one standard letter from HL Legal which i responded to with the relevent template. I received my S.A.R back from AIC which said I had paid over £4000 over the last 10 years. I recieved a S.A.R back from RBOS which was very sparse, no details of payments made just phone calls etc spanning only 2 years. I have phoned SMS and told them to return to sender. 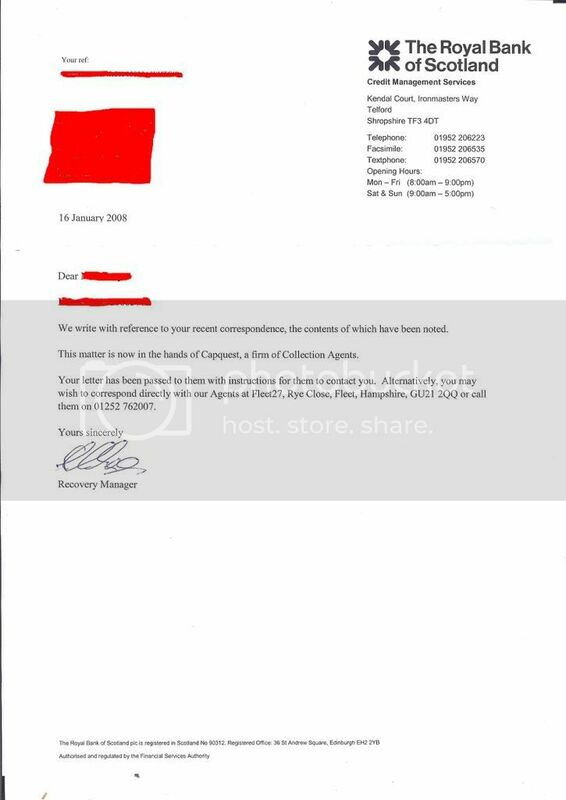 Just a quick update, I have today recieved this letter from Capquest, should I just ignore it as the are clearly in breach after all this time?